Fig. 31.1E), black-naped terns (S. sumatrana, Fig. 31.1F), and black noddies (Anous minutus, Fig. 31.1G), and about 25% of the wedge-tailed shearwater (Puffinus pacificus, Fig. 31.1H), brown booby (Sula leucogaster, Fig. 31.11), masked booby (S. dactylatra, Fig. 31.1/) and red-tailed tropicbirds (Phaeton rubricauda). In general, seabirds are colonial nesters. Throughout the GBR there are 56 major and 20 minor seabird colonies (Fig. 31.2). 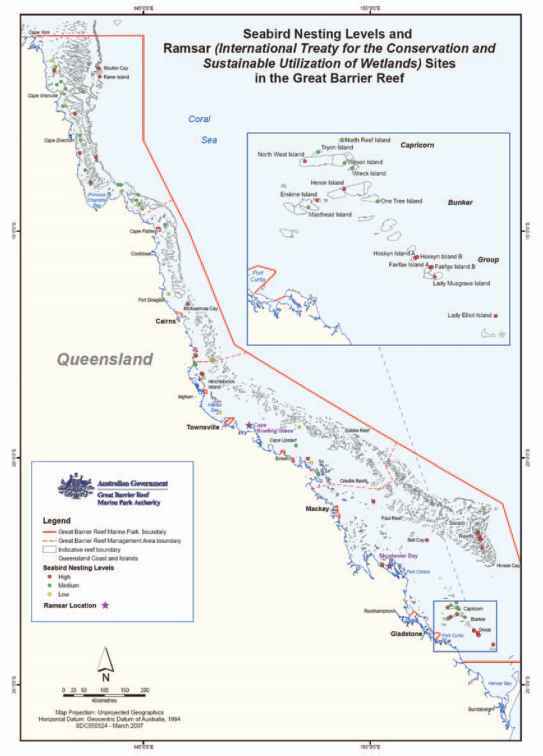 Most major colonies are located in either the far northern, northern or far southern regions of the GBR. Raine Island in the far northern sector is one of the largest and most significant tropical seabird breeding sites in Australia. 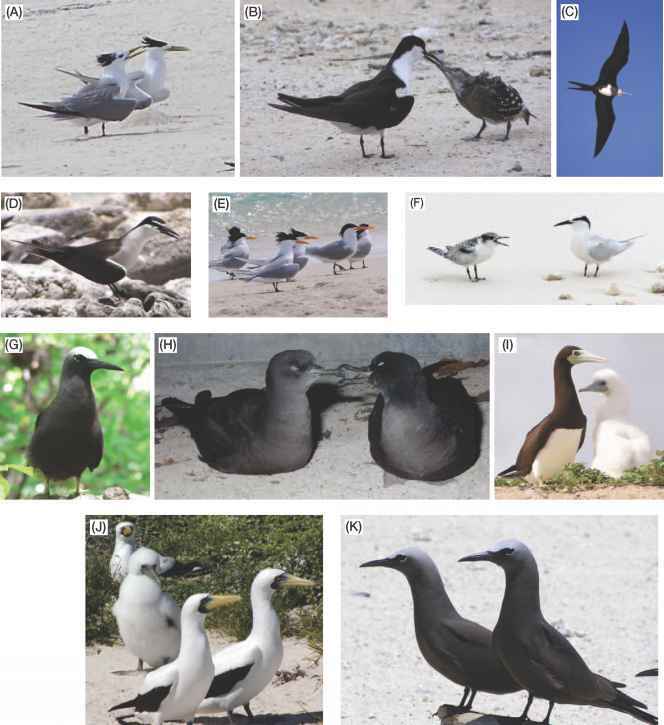 Of the 24 seabird species recorded as breeding in Queensland, 14 breed at Raine Island. A comprehensive review of the trends in seabird numbers at this site since the beginning of last century has recently been undertaken (see Additional reading). crested and lesser-crested terns. The islands of the Swain reefs in the far south-eastern region of the GBR also constitute one of six core seabird breeding areas. Finally, the Capricorn-Bunker group of islands in the far southern GBR contains nationally and internationally significant seabird breeding populations. This island group supports the Pacific Ocean's largest breeding colony of wedge-tailed shearwaters and over 97% of the black noddy populations of the GBR. 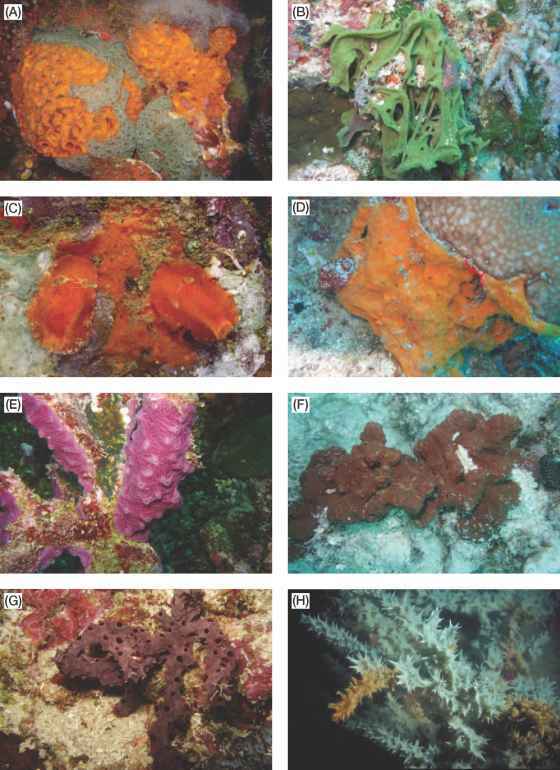 The Capri-cornia Cays also contain ~75% of the seabird biomass of the GBR World Heritage Area. Many seabird species that breed within the GBR and in adjacent areas are considered migratory and/ or threatened species and are listed under the Australian Environmental Protection and Biodiversity Conservation (EPBC) Act 1999 in a variety of categories. Many are also variously protected under international agreements such as: the China-Australia Migratory Bird Agreement (CAMBA), Japan-Australia Migratory Bird Agreement (JAMBA) and the Convention on the Conservation of Migratory Species of Wild Animals (Bonn Convention 1979). Additionally, the GBR region hosts migrating populations of some northern hemisphere breeding species such as common tern (Sterna hirundo) and much of the Asian population of roseate tern.